Autumn is a great time of the year to be in Western New York. Among other things, people can observe and participate in the ancient natural rituals of animal migration. Our location, at the confluence of Lake Erie and the Niagara River strait hosts significant migratory activities including the very visible and localized pass-throughs of birds and butterflies. Animals use this region in ways that are locally and globally consequential. The whole of the Niagara River corridor is a “Globally Significant Important Bird Area (IBA). An IBA is a place upon which significant numbers and species of birds depend, and in which there are serious conservation threats. The fact that the Niagara River Corridor is a “globally significant” IBA reflects the fact that many at risk bird species in staggering numbers depend upon this area for migration, breeding, and seasonal residencies, including vast numbers of wintering birds. The “Globally Significant” IBA designation means that the conservation importance of the Niagara is on par with places such as Yellowstone, the Everglades, and the Galapagos. Some of the birds that depend upon the Niagara travel to and from very distant places including the arctic, the boreal forests and coasts of the Pacific Northwest, and the Amazon basin. And you can see them here in our region. During September and October millions of shorebirds, vultures, hawks, eagles, and neotropical warblers migrate through our region. Many nights one could hear them calling in the dark skies as they passed overhead. Mornings they could be found in roosts and hotspots including local nature preserves and along the waterfront. Local and regional radar images help to show the vastness of these flocks of some of the world’s most important and endangered birds. November through late January will bring the experience of the Niagara River magnificent gull migration. 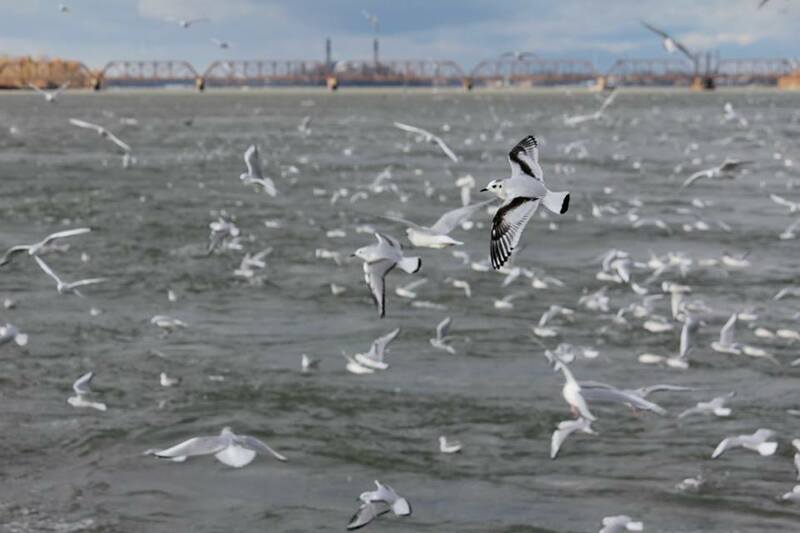 As many as 19 species of gulls, some of them very rare, migrate through the Niagara River Corridor. During the migration more species of gulls in high global concentrations can be found here than almost anywhere else on the planet. Studies suggest that some species such as the Bonaparte’s gull come through here with as much as 40% of the worlds total population. Throughout the winter waterfowl, including ducks, geese, swans, and almost 50 other species of birds make the Niagara River area their winter home. These beautiful birds migrate from places like Alaska, Hudson Bay, the tundra, northern forests, and circumpolar arctic regions. The Niagara River is their Miami-it is historically the first open water that they encounter as they travel south from the far north. During the winter months the Niagara is an amazing spectacle of birds, water, ice, and the outdoors. It is one of the most special places on earth for birds. Often during the winter there are what are called “irruptions” of species of birds from the far north in search of food. Irruptions occur when food and habitat become scarce in their normal range. In the past few years we have seen significant irruptions of important northern species. Last winter, Snowy Owls, a rare bird for our region, which the nature conservancy considers one of the most at risk birds on the planet, came to WNY and our waterfronts in numbers never seen before. If you wanted to see a snowy owl in this region last year, you could find one. Dozens. Hundreds. We also had a lot of loons. While seeing 10 loons during a winter is normal for this region, thousands of them appeared. One day over 100 were observed at the Buffalo Harbor State Park. Currently there is a significant irruption of winter finches. Fear not, America may be on the cusp of its last election, but as sure as anything is, spring will return again. Starting in late winter the once almost vanished New York State Bird, the Eastern Bluebird, will show up in our fields and meadows singing its gentle churr-a-wee song. This is a sure harbinger of the spring to come. Soon after songbirds and neotropicals once again light up our radar, make beautiful night music in the sky, and roost and rest throughout our region in colorful feeding hotspots. Between March and June these little jewels- 35 plus species reliably come through here on their long journey north. Some stay to breed, some move on. But here is a very great relevancy- many of these neotropical and songbirds including most of our swallows winter from Central America to the Amazon. We have breeding birds here that are a part of the biodiversity of Amazon ecosystem! This is connectivity. These animals depend on this region as much as humans depend on a healthy planet. Our stewardship should be a primary economic, educational, recreational, and climate resiliency priority. We still have a chance if we make the right kind of development and conservaation decisions. What we do as stewards here matters to the biodiversity and the health of the earth. Our actions here are globally significant.